Preparing Justin for a rider has been a fun and rewarding process. 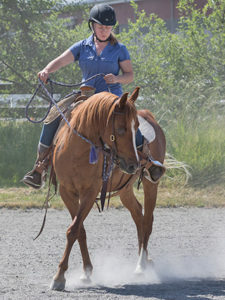 This gelding’s sweet disposition continues to shine through. He is a willing horse with a lot of try. The more we work him, the more we fall in love with his kind eyes. We hope to ride him in the near future, but we are letting him lead the way. He doesn’t have to prove anything to us. 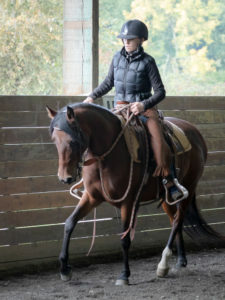 As an older restart with a troubled past, restarting as a riding horse can prove difficult. We are chipping away at his hesitations and he continues to relax. The goal of the ground work is to prepare him for what the rider will ask. Another part of his training is for us to put him “in a bind” so we can show him that no one will hurt him. It’s not about desensitizing him, but rather teaching him he doesn’t have to overreact in stressful situations. We will never ask him to do anything he is not able to do. 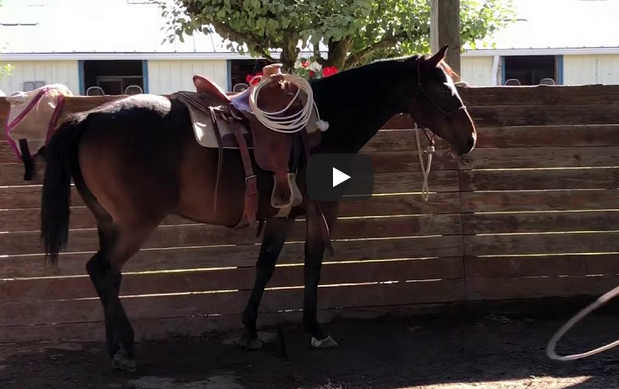 This horsemanship work helps troubled horses like Justin realize they can calm down after having been wound up. In the face of future stress he can draw from these good experiences and remember we always take care of him. 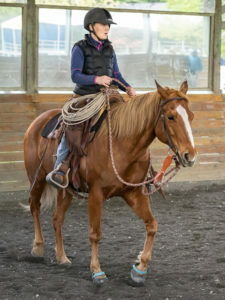 Justin naturally likes people and will make someone an endearing partner, either as a riding horse or as a companion, that remains for him to tell us.